64floz 100% Apple juice this particular size is the same price as their 48floz size $1.39 plus .50c in store coupon making them .89c each I bought 5. I bought 4 juice boxes 100% Apple n grape juice for my sons school lunch they're .25c each regular price. 2 2l8tr drinks $1 each, 12 pack ramen noodles $2.28, 2 Greek yogurts the small ones were half price .45c each for my hubbies lunch, 7 cans cat food reg. Priced .35c, del Monte canned sweet peas 60%off at .34c can, Casa fiesta can refried black beans they were b1g1free making them .41c a can. Ronzoni vegetable spaghetti n rotini were on sale $1 each, tortilla chips $1.19 bag reg priced, pace salsa 24floz $1off, $1.68, 36qty red plastic spoons $1, whole wheat bread .85c reg. Price. So that's my super nerdy super savings today! 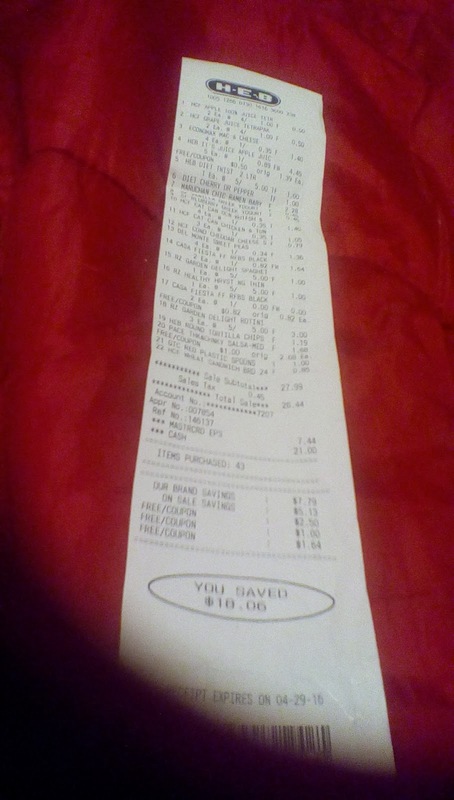 I bought 43items for $28.44 n saved $18.06 from heb brand, on sale n coupon savings. This can be duplicated at any local grocery store. It is possible to save more $, and do it without using ccs #Dave ramseyprogramrocks!